The Bear Report / Thyra Heder – Abrams Books for Young Readers, 2015. 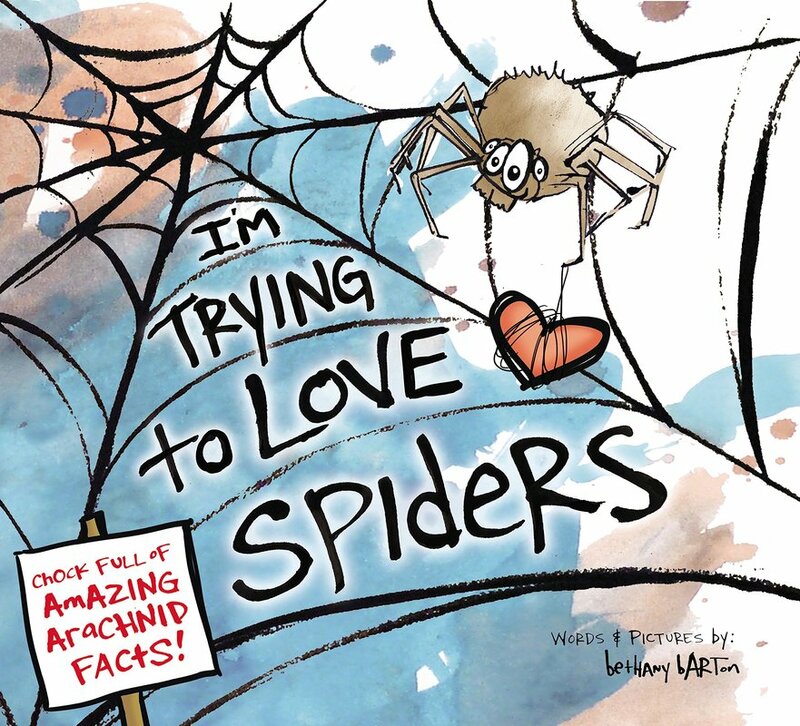 I’m Trying to Love Spiders / Bethany Barton – Viking Books for Young Readers, 2015. ​If You Plant a Seed / Kadir Nelson – Balzer + Bray, 2015. Little Tree / Loren Long – Philomel Books, 2015. The Night World / Modaicai Gerstein -- Little, Brown for Young Readers, 2015. Stick and Stone / Beth Ferry – Houghton, Mifflin, Harcourt, 2015. Sing a Season Song / Jane Yolen – Ashlock Creative Editions, 2015. Illustrations and rhyming text introduce the four seasons as icicle popsicles drip, daffodils bloom on hills, fireflies blink on and off, and honking geese fly by. Two Friends: Susan B. Anthony and Frederick Douglass / Dean Robbins – Orchard Books, 2016. The Way to School / Rosemary McCarney and Plan International -- Second Story Press, 2015. Minimal text and stunning photographs from around the world describe the remarkable, often dangerous journeys children make every day on their way to and from school. No simple school bus picks them up each day, but rather children travel through disaster zones, cross rapids, climb mountains, and maneuver on zip lines daily to get to the classroom. Some of them even carry their desks! Wolfie the Bunny / Ame Dyckman – Little, Brown and Company, 2015. ​When her parents find a baby wolf on their doorstep and decide to raise him as their own, Dot is certain he will eat them all up until a surprising encounter with a bear brings them closer together. Crenshaw/Katherine Applegate. Feiwel and Friends, 2015. ​Jackson’s imaginary friend, a giant cat named Crenshaw who eats purple jelly beans, comes back into the soon-to-be fifth-grader’s life to help him cope with the anxiety caused by his family’s financial struggles and impending homelessness demonstrating the power of friendship and resilience. Fish in a Tree/Lynda Mullaly Hunt. Nancy Paulsen Books, an imprint of Penguin Group (USA), 2015. Ally, a girl with dyslexia who has always been able to hide her inability to read with disruptive distractions, has a new teacher, Mr. Daniels, who recognizes the bright and creative girl she is and helps build her confidence to see that there’s a lot more to her and everyone else than a label. Fuzzy Mud/Louis Sachar, Delacorte Press, 2015. Fifth-grader Tamaya and seventh-grader Marshall take a shortcut home from school in an effort for Marshall to avoid a fight with bully Chad Hilligas, but their detour leads them to discover a dangerous, “fuzzy” substance that proves harmful for humans and threatens to be an environmental disaster. A Handful of Stars/Cynthia Lord. Scholastic Press, 2015. When her blind dog, Lucky, slips his collar, twelve-year old Lily meets Salma Santiago, a young Hispanic girl whose migrant family are in Maine for the blueberry-picking season, and, based partly on their mutual love of dogs, the two forge a friendship while painting bee boxes for Lily's grandfather. As the Blueberry Queen pageant approaches, however, Lily and Salma are confronted with some of the hard truths of prejudice and migrant life. Mesmerized: How Ben Franklin Solved a Mystery that Baffled All of France/Mara Rockliff, illustrated by Iacopo Bruno. Candlewick Press, 2015. During a visit to France during the American Revolution, Benjamin Franklin shows the development and practice of the scientific method to help determine if the invisible force that Dr. Franz Anton Mesmer claimed he was using to cure patients was genuine. Old Wolf/Avi, illustrated by Brian Floca. Atheneum Books for Young Readers, 2015. Nashoba, a older wolf struggling to keep his status as the pack leader, decides to trust Merla, a clever raven, to lead him to find desperately needed food in the Colorado woods where they encounter thirteen-year-old Casey, a boy whose hunting experience comes from a computer game, and who now must make difficult choices in the tense meeting between three very different hunters. Paper Wishes/Lois Sepahban. Margaret Ferguson Books, an imprint of Farrar, Straus, & Giroux (BYR), 2016. Near the start of World War II, ten-year-old Manami, her parents, and grandfather are evacuated from their home and peaceful sea life on Bainbridge Island and sent to Manzanar Relocation Camp, an ugly, dreary internment camp in the desert for Japanese-American citizens, whose conditions are made worse by the guilt and sadness Manami feels over the loss of her grandfather’s beloved dog, Yujiin. The Terrible Two/ Mac Barnett, illustrated by Kevin Cornell. Amulet Books, 2015. When master prankster Miles Murphy moves to sleepy Yawnee Valley, he challenges the local, mystery prankster in an epic battle of tricks, but soon the two join forces to pull off the biggest prank ever seen. Tucky Jo and Little Heart/Patricia Polacco. Simon and Schuster Books for Young Readers, 2015. During World War II, a fifteen-year-old soldier from Kentucky meets a sweet, young girl in the Philippines who helps him remember what he is fighting for as he helps her and others of her village avoid starvation, and many years later she returns his kindness. The War That Saved My Life/Kimberly Brubaker Bradley, Dial Books for Young Readers, an imprint of Penguin Group (USA), 2015. Nine-year-old Ada, a young girl with a clubbed foot, and her little brother, Jamie are evacuated from their squalid apartment in London during World War II to a much sweeter life in the English countryside with Susan Smith, a grieving woman who helps Ada to begin to heal physically and emotionally from the abuse and neglect of an ignorant, poverty-stricken mother. Drowned City: Hurricane Katrina and New Orleans / Don Brown – Houghton Mifflin Harcourt, 2015. On August 29, 2005, Hurricane Katrina's monstrous winds and surging water overwhelmed the protective levees around low-lying New Orleans, Louisiana. The riveting tale of this historic storm and the drowning of an American city is one of selflessness, heroism, and courage--and also of incompetence, racism, and criminality. Echo / Pam Munoz Ryan; Dinara Mirtalipova, ill. Scholastic Press, 2015. Goodbye Stranger / Rebecca Stead – Wendy Lamb Books, 2015. Bridge, survivor of a childhood accident, wonders why she’s still alive. As she makes her way through seventh grade on Manhattan's Upper West Side with her best friends, curvaceous Em, crusader Tab, and new friend, Sherm, she finds the answers she has been seeking. Each character navigates the challenges of love and change in this captivating novel. The Honest Truth / Dan Gemeinhart – Scholastic Press, 2015. A boy named Mark, tired of being sick with cancer, conceives a plan to climb Mount Rainier, and runs away from home with his dog, Beau--but with over two hundred miles between him and his goal, and only anger at his situation to drive him on, nothing will be easy, and only his best friend, Jessie, suspects where he is heading. Losers Take All : A Novel / David Klass – Farrar Strauss Giroux, 2015. Jack Logan is the youngest brother in a family of talented football players, and he might actually enjoy sports if he were not constantly pressured into taking one up. When the new principal decides that all seniors must play on a team, Jack and a ragtag group decide to get even by starting a rebel JV soccer team whose mission is to avoid victory at any cost. Lost in the Sun / Lisa Graff – Philomel Books, an imprint of Penguin Group (USA), 2015. In 5th grade, Trent mistakenly shot a hockey puck into a boy's chest. Jared, who had a heart defect, died. Now Trent is filled with rage, convinced everyone hates him. It isn't until Trent gets caught up in the whirlwind that is Fallon Little--the girl with the mysterious scar across her face--that things begin to change. Masterminds / Gordon Korman – Balzer + Bray, an imprint of HarperCollins Publishers, 2015. Eli Frieden lives in the most perfect town in the world: Serenity, New Mexico. Honesty and integrity are valued above all else. One day, he bikes to the edge of the city limits and something so crazy and unexpected happens, it changes everything. Eli convinces his friends to help him investigate and it becomes clear that nothing is as it seems in Serenity. The Nest / Kenneth Oppel; Jon Klassen, ill. – Simon & Schuster Books for Young Readers, 2015. For Steve, summer is just another season of worries. Worries about his sick newborn baby brother who is fighting to survive, worries about his parents who are struggling to cope, even worries about the wasp's nest looming ominously from the eaves. So when a mysterious wasp queen invades his dreams, offering to "fix" the baby, Steve thinks his prayers have been answered. But "yes" is a powerful word. And dangerous. Once it is uttered, can it be taken back? Popular: A Memoir: How a Geek in Pearls Discovered the Secret to Confidence / Maya Van Wagenen – Dutton, an imprint of Penguin Group (USA), LLC, 2014. Maya has never been popular, but before starting eighth grade, she decides to begin a unique social experiment - spend the school year following a 1950s popularity guide, written by former teen model Betty Cornell and record the results. Told with humor and grace, Maya's journey offers a thoroughly contemporary example of kindness and self-confidence. Rhyme Schemer / K.A. Holt – Chronicle Books, 2014. This novel in verse follows one seventh grader's journey from bully-er to bully-ee, as he learns about friendship, family, and the influence that words can have on people's lives. All American Boys / Jason Reynolds. A Caitlyn Dlouhy Book/Atheneum Books for Young Readers, 2015. All the Bright Places / Jennifer Niven. Alfred A. Knopf, 2015. Jackaby / William Ritter. Algonquin, 2014. Mosquitoland / David Arnold. Viking, an imprint of Penguin Group (USA), 2015. When she learns that her mother is sick in Ohio, Mim confronts her demons on a thousand-mile odyssey from Mississippi that redefines her notions of love, loyalty, and what it means to be sane. Need / Joelle Charbonneau. Houghton Mifflin Harcourt, 2015. None of the Above / I.W. Gregorio. Balzer + Bray, an imprint of HarperCollins Publishers, 2015. Homecoming queen Kristin Lattimer has a hard enough time dealing with her body, but her visit to the doctor reveals a difficult truth, Kristin is intersex, which means that though she looks like a girl, she has male chromosomes, not to mention boy "parts" and after her diagnosis is leaked to the whole school, her identity is thrown into question. Not After Everything / Michelle Levy. Dial Books, an imprint of Penguin Group (USA) LLC, 2015. After his mom kills herself, Tyler shuts out the world--until falling in love with Jordyn helps him find his way toward a hopeful future. Red Queen / Victoria Aveyard. HarperTeen, an imprint of HarperCollins Publishers, 2015. Rig (The) / Joe Ducie. Houghton Mifflin Harcourt, 2015. Fifteen-year-old Will Drake has made a career of breaking out from high-security prisons. His talents have landed him at the Rig, a specialist juvenile holding facility in the middle of the Arctic Ocean. No one can escape from the Rig. No one except for Drake. Salt to the Sea / Ruta Sepetys. Philomel Books, 2016. Told in alternating points of view, this masterful work of historical fiction is inspired by the real-life tragedy that was the sinking of the Wilhelm Gustloff-- the greatest maritime disaster in history. As World War II draws to a close, refugees try to escape the war's final dangers, only to find themselves aboard a ship with a target on its hull.